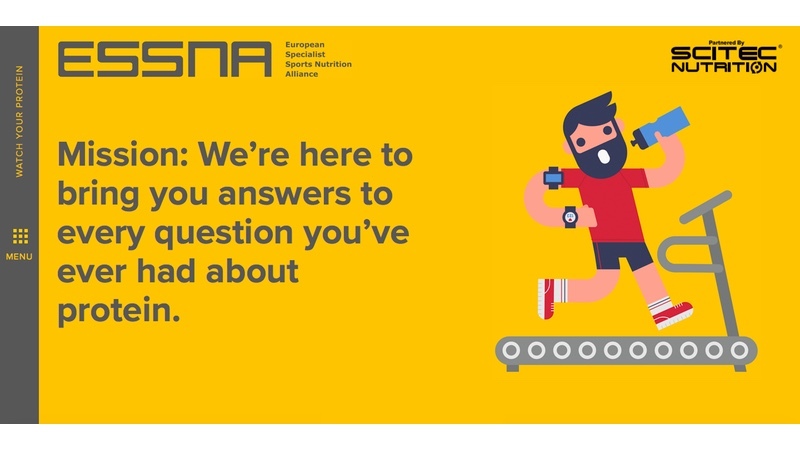 Positioned as an essential online resource dedicated to educating the public on how to buy and consume protein products – a new ‘Watch Your Protein’ website, www.watchyourprotein.com, has been launched by the European Specialist Sports Nutrition Alliance (ESSNA), the sports nutrition industry trade association. The initiative sits alongside ESSNA’s work to purge irresponsible companies from the sports nutrition industry and eradicate the existence of sports nutrition products that do not abide by the rules and regulations put in place for the protection of consumers. ESSNA has so far tackled over 400 cases of products that have misled consumers and/or included banned doping substances. The trade organisation recognises that there is a further need to raise the public’s awareness of correct usage of products, particularly as the sports nutrition industry continues to move further into the mainstream. ‘Watch Your Protein’ outlines different sources of protein; the benefits of each source; how protein should be consumed; how to read a protein product label; guidance on dosages; and, crucially, where protein should be purchased from and how to avoid illegal products that could pose a risk to the public’s health. ‘Watch Your Protein’ follows the launch of ESSNA’s dedicated kitemark to help the public identify products belonging to its members – who sign up to its strict Code of Conduct, emphasising a commitment to product quality and the consumer. Dr Adam Carey, Chair of ESSNA, said “Protein as an ingredient now sees the highest volume of sales in the sports nutrition industry and has become more mainstream than ever. It is used by everyone from a yoga enthusiast eating a protein bar prior to a work out to a weightlifter looking to ‘bulk up’ and supplementing their protein-rich diet with a protein shake. Because of this, it is more important than ever that the public know what they’re buying, how to use it and where to purchase it from reputable manufacturers and retailers. He continued, “But more than that, we want an informed public. It’s time once and for all to make sure the public understand what they’re consuming and how they can stay safe while consuming it. ‘Watch Your Protein’ will educate them on everything from what benefits they can expect to see, to what brands they can trust, to what ingredients they should avoid.